La Villa Eugene is an inspiring 19th Century building set alongside some of the biggest names in Champagne. Originally belonging to the founder of Mercier Champagne; the hotel deserves its place on the Avenue de Champagne, some say the richest street in the world due to the innumerable bottles of Champagne kept beneath. Just a 10 minute walk to the centre of Epernay, La Villa Eugene itself is in a quiet and unspoilt location. Set amongst its own beautiful park this is a wonderful place to relax and unwind. For those who enjoy exploring the nightlife it’s just a short walk to all the bars and restaurants of Epernay. Highly recommended is a walk up the illuminated Avenue de Champagne in the evening, a reminder of the investment that makes this region so special. With just 15 rooms, you may begin to feel like a member of the Mercier family who owned this glorious building so long ago. 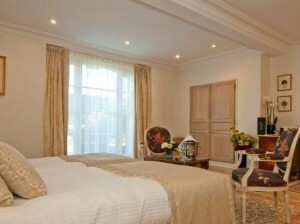 The luxury facilities include a breakfast room, with large windows overlooking the beautiful park. In the summer months there is a outdoor swimming pool and terrace, the perfect venue for enjoying the region in summer. As well as these luxuries Villa Eugene has complimentary wifi throughout, the car park is secure and locked after 11 each evening. The rooms at La Villa Eugene remain true to this building’s history, which each room decorated in either Louis 16th or colonial styles, and the result is unique rooms with sumptuous furniture. There are 5 grades of room here Premier; Prestige, Deluxe Prestige, Deluxe Terrace and Suite Prestige.